Enfin des options de filtres sur les résultats de recherche Google ! Bien que la vidéo passe beaucoup de temps à nous montrer la « Wonder Wheel », ce sont les premières options que j’attends avec impatience : filtre par type, par date, etc. 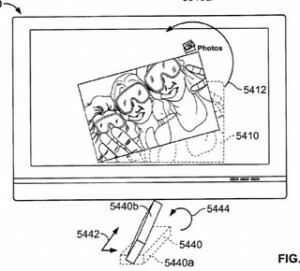 (plus besoin de passer par la recherche avancée pour rapidement affiner ses recherches). In her post on Presse-Citron Stephanie Booth appeals to bloggers to write about great women of science and technology, in honor of Lady Ada Lovelace, known as the first computer programmer. Ada was the daughter of Lord Byron, the Romantic poet. Her mother Anne Isabelle was a mathematician herself who, after separating from her husband right after her daughter’s birth, thought mathematics would be a solid antidote to the poet’s genetic « madness » and made sure the girl was taught science. Ada is famous for having envisioned a computer and written a program. Of course, there are also sources claiming that she did no such thing, that her role was merely secondary, that she was an unfaithful wife, an alcoholic and a « hysterical » woman. I am sure many great men of science were bad-tempered promiscuous alcoholics, but did it ever make anyone doubt THEIR scientific abilities? You can read more about Lady Ada here, but I would like to write about a Russian 19th century woman mathematician, Sofia Kovalevskaya – or Sophie Kowalevski, as she spent most of her adult life outside Russia. She left Russia when she was only 16 to study in Germany because, you see, Russian universities of that time did not allow women. She could only do so if her husband gave his official permission, so Sofia married Vladimir Kovalevsky: you had to have a husband, of course, to have his permission. She became the first woman to earn a doctorate in science and the first woman in history offered a full professorship in a university in Stockholm when she was 33. She won scientific prizes and made a celebrated discovery known as « Kovalevsky top ». Unfortunately both brilliant young women died young: Ada at 36 from cancer and Sofia at 41 from pneumonia. A friend who just moved back to France after a long time in US complained about not having a French version of Yelp, a social review service allowing you « to decide on the best place to eat in any part of the country within minutes ». The service exists due to kind souls who sit down after a good meal (or a bad one) and write something about it. You’d be surprised how many kind souls there are if you look at the site. And not so kind ones too. Personally I wonder whether the urge to write a bad review is not slightly stronger than to write a good one (after a good meal you are satisfied, after a bad one you still crave something), which would make this kind of service unbalanced. But this is not the point. The point is that for a large number of things we now more often consult opinions of people « like ourselves » rather than experts on the subject. We « rely on the kindness of strangers » rather than institutions. We had encyclopedia, written by scholars, now we have Wikipedia, written by… well, everybody. We had travel guides written by journalists, whose job it was to visit those places, now we go a social network to talk to other travelers. We had search engines, now we prefer to Twitter our question or pose it in our Facebook status. Someone would always answer and the answer would probably be exactly what we asked for, because those people happen to know us – and institutions do not. One could argue that we now let ourselves be misled more often. But one could also argue that all information is always in some way subjective. Just consider how many institutions are now on their way if not to extinction than at least to a profound transformation. Phone books. Yellow pages. Travel agencies – does anyone still go to those? Travel guides. Folding maps, so impractical when you have GPS on your mobile. Cook books – the last time you bought one was probably to give it to somebody as a present, and this person put it on the shelf and never looked at it again. « How-to » books – we have a YouTube category for that. Dictionaries – long live spell checker. Paper agendas – not flexible enough anymore. And so on. 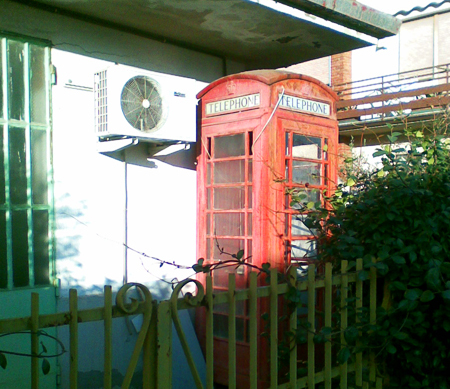 In Italy I came across a typical British public phone booth, now a curiosity in somebody’s garden. Italians cannot live through a day without their mobile phone, so I thought this illustrates well my point. La culture bottom-up, où chaque groupe cherche à développer la meilleure interface possible, tend à rendre l’effort d’homogénéisation très difficile. En outre, les décisions de design sont guidées par la « data ». La conséquence de cette culture sur les designers en interne. En complément du post de Vivien, voici un article très intéressant de Mac Génération sur les évolutions possibles du média center Apple et des nouvelles interactions de la télécommande « wiimote like ». Recently I read a book by a contemporary Russian novellist, playwright, actor and music artist Yevgeni Grishkovets entitled, in my plain translation and omitting the Russian play of words, « A year of Livejournal ». The book is a collection of writer’s blog articles of 2007, a period in which he was working on his currently bestselling novel « Asphalt », performing his one-man shows across former Soviet Union and recording his songs. 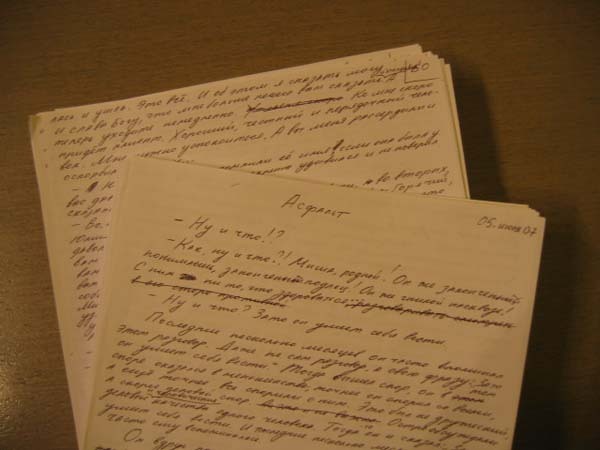 The book born from his blog is an intelligent and entertaining read, but the fact that made me write an article about it myself is this: the writer Yevgeni Grishkovets does not actually know how to type. All his manuscripts are written by hand and then typed out by a professional typist. Grishkovets is not an old writer – he is only 42 – he just never learned how to use a keyboard. Computers, as he confesses in the book, are still a foreign country to him. His articles are typed by his wife to whom Grishkovets dictates. In the 19th century the person writing the final manuscript version of a novel was often the writer’s wife. Both Tolstoy and Dostoevsky employed their beloved to do this tedious job. This is actually how Dostoevski met his future wife – he needed somebody to write the « clean » version of his manuscript and Anna was a hardworking young woman who knew stenography. Vous vous trouvez dans les archives du blog de Use Design pour mars 2009.